Have a great summer……we will see you in August! WORK PERMITS: When you get a work permit EVERY box needs to be filled out on the Intent to Employ form before we will issue you the work permit. If you are getting one over summer break, please refer to the sign posted at door M as to what our summer hours are. If you still need to pick up your graduation tickets see Mrs. Stealy or Miss Huicochea in the main office. In addition to all the summer athletic opportunities offered by our coaching staff, the GHS athletic department will again offer PiYo every Wednesday starting May 31st through June 28th from 10:30-11:30 a.m. in the warehouse. All perspective student-athletes and GHS staff are welcome to take advantage of this awesome one hour workout that focus on balance and core work. If you need a summer opportunity calendar for your sport, see Mr. Kissinger in the athletic office or check the GHS website for your sport! All seniors and juniors graduating early must attend graduation practice on the last day of school. The practice is TODAY at 2:30 p.m. in the main gym. 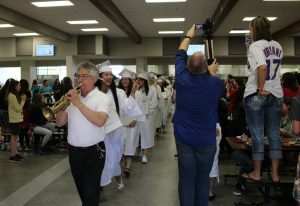 You do not need to wear your cap and gown – just come to the main gym at that time. Seniors not graduating or not planning to walk at graduation will remain in their SRT room at that time. Reminder for Graduates of 2017: Your school Gmail account will be closed soon after graduation…..probably by August. If you want to save any files out of your Google Drive or Gmail you will need to copy or move those before August. Seniors: If you ordered items and missed the cap & gown delivery day, please e-mail Mrs. Gardner to make arrangements to pick up your items. IHSAA Student-Athlete Tip of the Week: Every high school student-athlete faces challenges–in the classroom, in their sport, and even at home. It seems like there is always an obstacle to overcome. Research is clear that it really does pay to be positive during difficult times. The benefits include enhanced health and longevity, happiness, career advancement, and athletic performance. Writer Jon Gordon says that “positive people who regularly express positive emotions are more resilient when facing stress, challenges and adversity.” How can you become a more positive person? Tasting success in the classroom and on the athletic field will help, but should not be the determining factor. Try and make each day positive not only for you, but for someone else, as well! Seniors: If you are going to college this fall and have not filled out a green sheet that was passed around during M & M day, please stop in the guidance office to let them know what school they should send your final transcript to. Please also let guidance know if you have received any scholarships. Thank you! If you are enrolled in summer school and need bussing, please contact transportation to make arrangements at 533-7176. Juniors: Don’t forget to turn in your consent form if you are planning to take part in the Work Ethic Certification program during your senior year. Forms are available in the main office with Mrs. Wolfe. The Elkhart County 4-H Fair will host Education Day on Friday, July 21st. On Education Day, all students can get into the 4-H Fair at no cost until 3:00 p.m. by just showing your 2016-17 school ID! College students are also included in the promotion. Students must enter at the main gate. There will be displays from local colleges, educational things for you to do (including drones that you can fly) and local high school groups will perform throughout the day. REMINDER FROM THE CAFETERIA: For the rest of the school year you will not be permitted to charge to your lunch account. Need a health credit? GHS is offering health this summer. The class will be on Apex, and will be here at GHS. See your counselor if you are interested in signing up. This year is the first year that summer PE will be offered to high school students. You have until TODAY to enroll. Summer PE runs from June 5th through the 28th from 10:00 a.m. to 2:00 p.m. The cost to enroll is $80. Students must provide their own transportation. 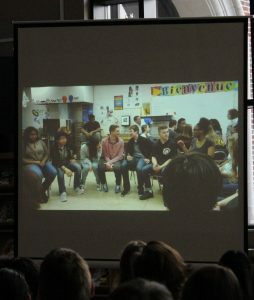 The good news: Next year students from GHS will be visiting Italy and Spain over Spring Break. The better news is that there is still room for a few more adventurers! If you will be a junior or senior next year, and you’re interested in exploring the Vatican as well as the streets of Rome, Florence and Barcelona, see Mr. Zuber in room 8080 for more information. The Ultimate Frisbee Club meets after school on Tuesdays and Thursdays from 3:45-5:00 p.m. on the administration field. If you’re interested in learning how to play the sport of Ultimate Frisbee, you can pick up your required paperwork from Mr. Snyder in the choir office, Mr. Brubaker or from Lucas Kauffman. The paperwork should be turned in to Lucas Kauffman the first time you attend. Homework help will not be available after school this week. You will have SRT time to finish up on assignments. The boys varsity baseball team won the first game of the sectional 1-0 over Concord. Joey Peebles threw a complete game shutout on 78 pitches with 11 strikeouts, two walks and three hits. The RedHawk run was scored in the 1st inning after a leadoff double from Philip Wertz, a sac bunt from Charlie Collins and a two strike RBI groundout from Michael Pinarski. The play of the game defensively was a 4-6-3 double play (Koshmider to Pinarski to Colpitts) in the second inning with runners on 1st and 3rd with one out. The boys JV golf team defeated Westview and Jimtown at Herron Creek in LaGrange. Allan Garratt led the team with a 45, Gabe Yoder fired a 48, Don Perry 53, Joseph Narayan 54 and Derrick Stotts 58. The boys varsity golf team split with Westview and Jimtown at Herron Creek. Goshen was led by Peyton Cripe with a 43, Jake Jennette fired a 47, William Troyer 52, Ben Schneider 54 and Will Gaby 67. The girls varsity softball team defeated Warsaw in the Elkhart sectional by a score of 9-3. Kate Atkinson allowed just four hits and struck out eight. Elkah DeVoe led the offense with three hits and scored two runs. Alexia Nettrouer, Kate Atkinson and Jordan Nemeth all had two hits apiece. Girls varsity softball sectional finals are at Elkhart Central at 6:00 p.m. The boys varsity baseball team sectional semifinals are at Elkhart Memorial at 10:00 a.m.
All seniors and juniors graduating early must attend graduation practice on the last day of school. The practice is TOMORROW at 2:30 p.m. in the main gym. 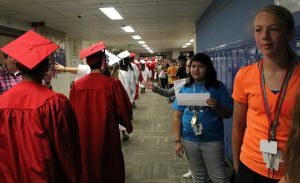 You do not need to wear your cap and gown – just come to the main gym at that time. Seniors not graduating or not planning to walk at graduation will remain in their SRT room at that time. Students who have signed up for Stratford: Please plan on meeting immediately after school TODAY in Mr. Caskey’s room (3180) to go over summer reading materials and more details about the trip next fall. See you then! Do you still want to sign up for Stratford, but haven’t yet made your deposit? Come to the meeting with your deposit in hand to reserve your spot! This year is the first year that summer PE will be offered to high school students. You have until TOMORROW to enroll. Summer PE runs from June 5th through the 28th from 10:00 a.m. to 2:00 p.m. The cost to enroll is $80. Students must provide their own transportation. 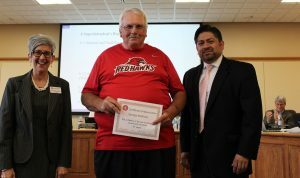 The Goshen RedHawk unified track and field team went to sectionals on Monday, May 22nd to take on Fort Wayne North Side, Elkhart Memorial, Homestead, Carroll, Warsaw, East Noble, Central Noble and Wawasee. In the 100m dash, Lexi Witmer took 2nd in her heat and Breighton Heaberlin and Ellie Kercher took 3rd in their heats with Heaberlin in 10th overall (out of 33). In the 400m dash, Zach Templeton and Jazmin Vargas took 4th in their heats and Templeton was 10th overall (out of 34). The 4x100m Relay team of Spencer Witmer, Jesse Rhoades, Laura Scott, and Zach Templeton came in 6th out of 9 and had their fastest time of the season. In the shotput, Jesse Rhodes and Austin Peeler took 4th and 5th in their flight. In the long jump, Jazmin Vargas took 2nd in her flight and 7th overall (out of 33) and Breighton Heaberlin took 8th overall (out of 33). The Redhawks took 8th out of 9 participating schools ending their season. Beating personal bests in Sectionals were: Austin Hardesty (400m), Zach Templeton (400m, 4x100m Relay), Laura Elliott (shot), Jesse Rhodes (shot, 4x100m Relay), Jazmin Vargas (Long Jump), Breighton Heaberlin (Long Jump), Chase Brown (Long Jump), Laura Scott (4x100m Relay) and Spencer Witmer (4x100m Relay). The boys varsity baseball team will compete in the 1st round of sectionals at Elkhart Memorial at 4:00 p.m. The boys JV and varsity golf teams will compete against Jimtown and Westview at Heron Creek at 4:30 p.m. 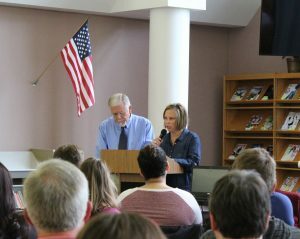 The boys varsity track and field team will compete in regionals in Kokomo at 6:00 p.m.
Dr. Younghans welcomed the IB diploma candidates and their families, and thanked the students for all of their hard work. Next, Mrs. Collins and Mr. Weaver awarded the IB stoles. And then the IB lamp was passed from the class of 2017 to a member of the class of 2018. 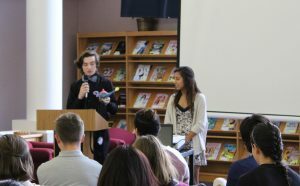 The class of 2017 shared about their CAS project over the last two years, in collaboration with students from an IB school in Flint, Michigan. 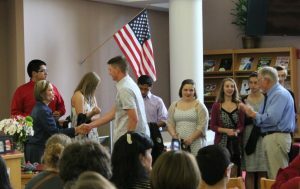 And then the students were presented to their families, GHS faculty, administrators, and board members as the 2017 IB Diploma Candidates. Congratulations, IB diploma candidates. Great job! All seniors and juniors graduating early must attend graduation practice on the last day of school. The practice is on Friday at 2:30 p.m. in the main gym. 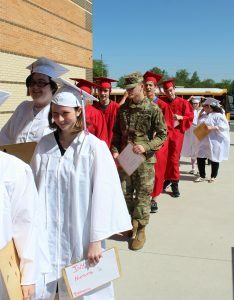 You do not need to wear your cap and gown – just come to the main gym at that time. Seniors not graduating or not planning to walk at graduation will remain in their SRT room at that time. Students who have signed up for Stratford: Please plan on meeting immediately after school TOMORROW in Mr. Caskey’s room (3180) to go over summer reading materials and more details about the trip next fall. See you then! Do you still want to sign up for Stratford, but haven’t yet made your deposit? Come to the meeting with your deposit in hand to reserve your spot! This year is the first year that summer PE will be offered to high school students. You have until Friday to enroll. Summer PE runs from June 5th through the 28th from 10:00 a.m. to 2:00 p.m. The cost to enroll is $80. Students must provide their own transportation. The girls track team performed well at regionals with Jill Kissinger advancing to State in the 300m Hurdles. Goshen had six girls competing, with the following girls placing: Jill Kissinger finished 3rd in the 300m Hurdles, the 4×400 Relay (Brandi Smith, Kyrah Fletcher, Alayna Yoder, Jill Kissinger) finished 6th after coming in seeded 11th and Suzette Rodriguez finished 8th in the shot put after coming in seeded 14th. Jill Kissinger will compete at the State Track Meet on June 3rd at IU Bloomington. The boys varsity baseball team will compete in the 1st round of sectionals vs. Concord at Elkhart Memorial at 6:00 p.m. The girls varsity softball team will compete in sectional semifinals vs. Warsaw at Elkhart Central at 7:30 p.m. The boys varsity golf team finished 7th in the conference tournament at Pretty Lake Golf Course in Plymouth with a team score of 193. Goshen was led by William Troyer and Peyton Cripe with 43s. Jake Jennette added a 53, Will Gaby 54 and Allan Garratt 71. The boys baseball C team fell behind early and could not mount a large enough comeback, losing to St. Joe by a score of 11-5. The RedHawks had a big 5th inning, scoring four runs. Jocsan Sanchez recorded two doubles and drove in one run to lead the offense. Martin Ramirez also recorded two hits and an RBI. Joseph Good pitched three innings of relief and did not give up a run. The boys baseball C team will play at Mishawaka at 5:30 p.m. 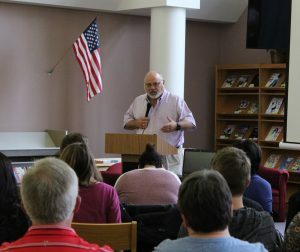 The girls varsity track and field team will compete in regionals at South Bend St. Joe at 6:00 p.m.
Dr. Woodworth introduced the Academic sub-committee members, who worked on the academic pathways for GCS students as part of the larger strategic planning process. She thanked them for their time and commitment to planning the educational pathways for students. 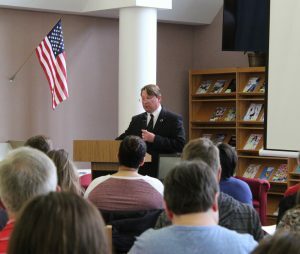 Dr. Woodworth introduced band director Tom Cox, who shared about the state champion winter percussion group (the students were actually outside practicing for the Memorial Day parade in Indianapolis). There are two winter percussion groups, movement and concert. The concert group was undefeated in all competitions all year and won the state championship. Winter percussion students include: Alex Garcia, Angel Bazia, Angy Cruz, Arely Garcia, Arthur Peterson-Veatch, Arturo Escobedo, Ashley Sanchez, Ben Taubert, Bryan Garcia, Bryan Moreno, Carson Adkins, Cruz Garcia, Daniel Bowser, Daniel Guipe, Dylan Steury, Emanuel Contreras, Eve Miller, Fabian Perez, Hank Miller, Isaiah Kaufman, Javier Castillo, Joana Regelado, Honathon Garcia, Jose Montanez, Kevin Sanchez, Maddy Martinez, Matthew Schrag, Melissa Daniels, Nathan Garratt, Noe Palacios, Octavio Blacut, Oscar Lopez, Oscar Peterson-Veatch, Pablo Palacios, Paul Drescher, Sam Peeler, Samantha Linares, Sasha Rivera, Yaira Roman, and Zach Buckmaster. 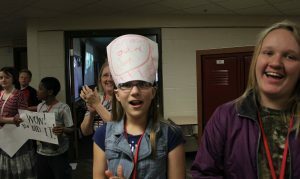 GMS students were named Rocket Science Winners after they created winning ice cream flavors in their New Tech classes. Teachers Theresa Harley and Shannon Layne guided the students, as they experimented with flavors. Once they had their creations, they took the flavors to Rocket Science ice cream in Nappanee and had them frozen. If you go to the store this summer, you can try the GMS flavors! 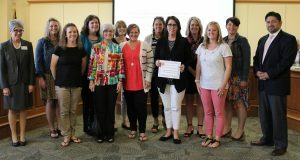 West Goshen Elementary was named a finalist for the NIET (National Institute for Excellence in Teaching) Founder’s Award. There are only 6 finalists from across the nation and WG was one of them! 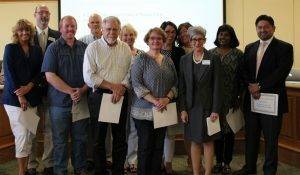 Lisa Hetler and Bill Rieth, GCS foundation board members, recognized teachers who were honored by the Thank A Teacher campaign which is sponsored by the foundation. 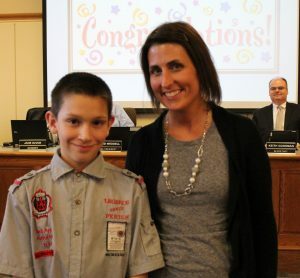 They stated that the Thank A Teacher campaign began because they wanted to recognize and support teachers in Goshen. 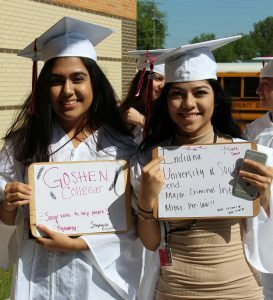 “We enjoy highlighting the excellent teaching staff in Goshen.” They read some of the things that people had written about teachers when they made contributions in their names. 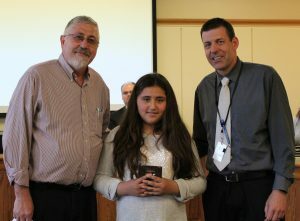 This year the foundation received 26 letters and contributions in teachers’ names, earning $1,100 for the foundation. This money will be used to sponsor teacher grant requests in the future. 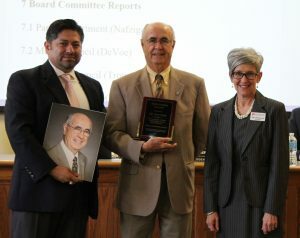 Dr. Jose Ortiz was also recognized for his service and dedication to GCS students and staff as a member of the school board. Dr. Ortiz has resigned his position, effective after the GHS graduation. 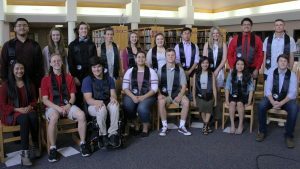 The GHS International Baccalaureate (IB) diploma candidates will be honored with a reception in the GHS media center on Tuesday evening at 7:00 p.m. At the reception, the students will be awarded IB stoles to wear at graduation. The IB stoles indicate the completion of the full course of study for the IB diploma. 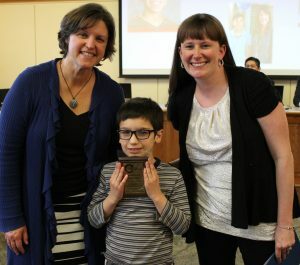 Congratulations to the following students, for undertaking the most rigorous high school diploma in the world: David Aguilar, Ana Avila, Zachery Berg, Riley Bove, Sadie Coley, Charles Collins, Andrea Cruz, Maria Cruz, Benjamin Hathaway, Amy Holbrook, Evan Krabill, Ariana Perez Diener, Catherine Pollock, Emma Russell, Irving Suarez, Sara Taft, Jesse Torres, and Mitchell Walters. 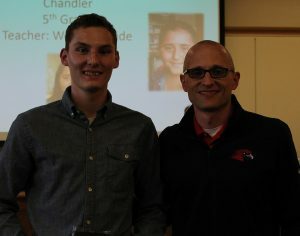 Thank you for your hard work and commitment to GHS academics, along with the many other things you do to represent GHS! Seniors: If you still need to order a cap and gown you can visit their web site at www.highschool.herffjones.com to place your order. 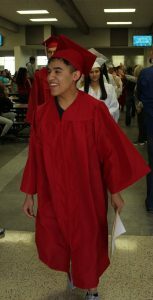 If you ordered items and missed the cap & gown delivery day, please e-mail Mrs. Gardner to make arrangements to pick up your items. Are you still interested in the Stratford trip next fall, but haven’t done anything about it yet? There’s still time! If you’d like to go, but need more information, email lycaskey@goshenschools.org or stop by room 3180. Deposits are due by Friday! The Goshen RedHawks finished a close 2nd to Warsaw Thursday night during the Goshen Sectional. The RedHawks had three individual champions and many others that placed very well for the team. The top four teams included: tie at 78 points for Northridge and Elkhart Central, Goshen 94 and Warsaw 101. This is the second time Goshen has been runner-up in our track history and for the second year in a row. Performances: Champions included: Lucas DeMoya in the pole vault with a new personal best of 14’4”, Brock Tauteris in shot put & Josuel Sanchez was a double champion in the 110 hurdles and 300 hurdles. Goshen also placed second in the 4×800 relay (team of Zach Oyer, Jason Brahona, Bryant Grewe & Bryan Olvera –season best time), Andy Wang was 2nd in the discus followed by Steven Worlds in 3rd. The 4×400 relay finished 3rd dropping 7 seconds from their previous season best (team of Brandon Holley, Rummel Johnson, Zach Oyer & Josuel Sanchez. Rummel Johnson finished 2nd in the high jump at 6’4”. Other places included Zach Oyer in the 800, Simon Myers in the high jump, Felix Perez-Diener in the 3200, Thomas Heim in the shot put, the 4×100 relay & a personal best by Orlando Hernandez in the 300 hurdles. Great job RedHawks and good luck at Regionals next Thursday. The girls tennis season ended in the rain-soaked sectional final Saturday morning to Northwood. The RedHawks picked up their 20th win of the season on senior day vs. Jimtown ending with a score of 8-2. Tyler Colpitts picked up his 8th win of the season throwing six innings, giving up one earned run and striking out eight. His ERA for the season was lowered to 1.53. Offensively, Chava Garcia, Mike Pinarski, Robbie Riegsecker and Austin Bontrager all had two hits for the RedHawks. The girls varsity softball team won big on their last game on their home field for the season. Kate Atkinson pitched a good game only allowing three hits for the day. Kate also had three hits and drove in one run. Caitlyn Doyle had two hits and two RBI’S while Gracie Hayes also added two hits. Alexia Nettrouer had one hit and two RBI’S. Congrats to Elkah DeVoe for braking the most steals in a season record with 26 which was held by her Aunt Brittany Barkes. The girls varsity softball team sectionals – 1st round will be at Elkhart Central at 5:30 p.m. The unified track and field team will compete in the Unified Track and Field sectionals at 6:00 p.m. at Central Noble. The boys baseball C team will host South Bend St. Joe at 5:00 p.m.
All seniors and juniors graduating early must attend graduation practice on the last day of school. The practice is on Friday, May 26th at 2:30 p.m. in the main gym. 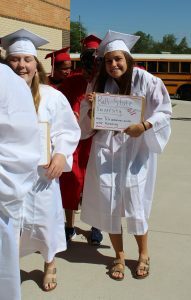 You do not need to wear your cap and gown – just come to the main gym at that time. Seniors not graduating or not planning to walk at graduation will remain in their SRT room at that time. Juniors: Don’t forget to turn in your consent form by TODAY if you are planning to take part in the Work Ethic Certification program during your senior year. Forms are available in the main office with Mrs. Wolfe. Are you still interested in the Stratford trip next fall, but haven’t done anything about it yet? There’s still time! If you’d like to go, but need more information, email lycaskey@goshenschools.org or stop by room 3180. Deposits are due by Friday, May 26th! The Talent Show is here! This year the Cowboy Up! Talent Show will be held TONIGHT at GMS from 7-9:00 p.m. Come and enjoy the great GHS student’s performances. Don’t forget your cowboy costume! Go all out, but make sure it’s school appropriate and follow the school dress code – no toy guns please. The GHS cafeteria is offering free after school snacks THIS WEEK. This program is only for students in after school activities on that day. All student-athletes, club members, music participants, drama participants, after school homework help kids, etc. are strongly encouraged to stop by the cafeteria after school and take advantage of this generous opportunity. Students just need to show their ID and they can grab a healthy snack to go that will hold them over during their after school activities until dinner. The cafeteria will stay open until 3:50 p.m. to hand out the snacks. This year is the first year that summer PE will be offered to high school students. You have until May 26th to enroll. Summer PE runs from June 5th through the 28th from 10:00 a.m. to 2:00 p.m. The cost to enroll is $80. Students must provide their own transportation. Please join us for ADEC’s Walk, Run or Ride a Bike TOMORROW at 7:30 a.m. at Northridge High School. You can register online at www.adecinc.com/bike. On-site registration is also available. The ride starts at 9:00 a.m. Ride, walk or run and raise funds to support people with disabilities in Elkhart County! The fee is $30 for adults and $15 for youth. This year we are pitting local students against each other for a chance to win cash for their school. The school with the highest participation rate will receive $500 to be used on its fitness program. Simply register online as a “youth” participant. When you pick up your packet you will find a ticket to cast your vote for your school. May the best school win! 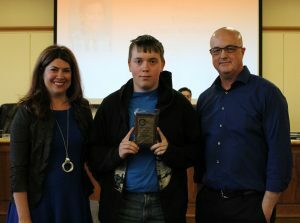 The Goshen Unit of the Boys & Girls Club of Elkhart County has operated in four different sites this school year – Grace Community Church, First Baptist Church, Chamberlain Elementary School and North Goshen Mennonite Church. We thank you all for your assistance and patience during this process! We will begin our summer programs on June 12th in a beautiful, newly renovated and much larger club! To give our staff time to prepare the newly remodeled club for summer programs our school year programs ended last week. You are all welcome to join us in celebrating our opening during our Community Open House on June 10th from 9:00-11:00 a.m. at 306 Crescent St. in Goshen. If you have any question feel free to call our office at 533-4793. Thank you so much for your assistance and cooperation during the clubs transitional period! The boys varsity golf team defeated Elkhart Memorial 194-204. Goshen was led by senior Will Troyer who fired a 44. Peyton Cripe added a 45, Allan Garratt 52, Jake Jennette 53 and Will Gaby 59. Elkhart Memorial was unable to field a team for the JV match. The boys JV baseball season ended last night with a rough game falling to East Noble 15-3. The RedHawks recorded seven hits on the night from seven different batters. Jude Fitzgerald led the RedHawks offense with a double and two RBIs. Although the RedHawks pitching and defense struggled overall, James Troyer pitched two innings and gave up zero runs while striking out three batters. 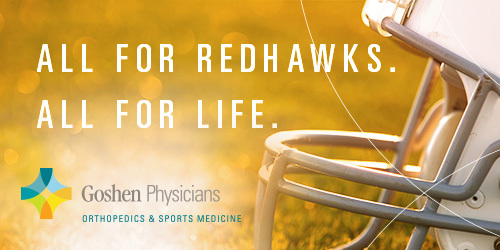 The RedHawks ended their season with a record of 8-17. RedHawk student Austin Peeler also set his career high in catching foul balls for the season, snagging his 3rd foul ball of the year. Austin has been a huge RedHawk supporter all season and made a terrific grab in the 2nd inning behind the 1st base dugout he frequently covers. The boys varsity baseball team picked up their 19th win of the season with a back and forth non-conference match up at East Noble. Joey Peebles started on the mound and threw four strong innings before Michael Pinarski threw the last three and got the win. The RedHawks hit five HR’s on the night including two from Philip Wertz and one each from CJ Detweiler, Will Koshmider and Trenton Scott. Michael Pinarski contributed two doubles. The girls tennis team avenged a loss in the regular season to Fairfield by downing them 3-2 in the sectional semifinal. Lineth Alvarez won 6-0, 6-2, Cheyenne Kalb overcame a 0-3 start to win 12 straight games and the 2 doubles pair of Brooke Grewe and Anna Podgorski won their 3rd match in the last four outings while only dropping two games. The girls varsity tennis team will host sectional finals at 4:30 p.m. CANCELED – The boys C baseball team will play ay Warsaw at 5:30 p.m. The girls JV softball team will host East Noble at 5:30 p.m. The boys varsity baseball team will host Jimtown at 10:00 a.m. The boys varsity golf team will compete in the NLC Tourney at Pretty Lake Golf Club at 10:00 a.m. The girls JV and varsity softball teams will host Westview. Varsity plays at 10:00 a.m., followed by JV at 11:45 a.m. 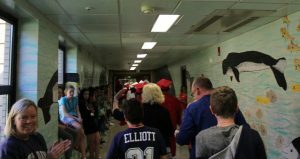 The unified track and field team will compete at Central Noble at 1:00 p.m.
A group of seniors gave up their SRT time today to take a “Victory Lap” through the halls of Goshen Middle School. 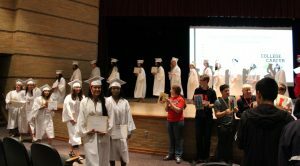 Organized by the counselors at both GMS and GHS, the seniors were excited to share their accomplishments and the GMS students were happy to congratulate them. The seniors wrote their future plans and goals on white boards to share with the GMS students. 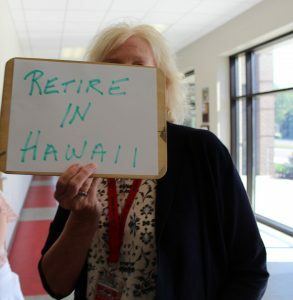 The retirees (Mrs. Cook and Mrs. Reihl) made their own signs! 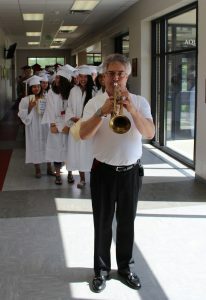 Mr. Mault led them through the school, letting everyone know the seniors were headed their way. 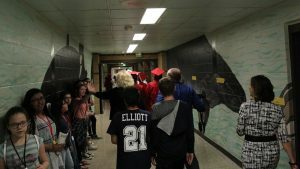 Students held signs of congratulations, and put out their hands for high-fives. More signs of encouragement from teachers and students. They walked through the cafeteria. They took one more walk through “Fish” hallway. 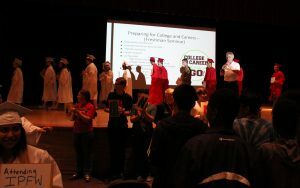 They walked through a GHS presentation in the auditorium. And then they gathered for one more picture. 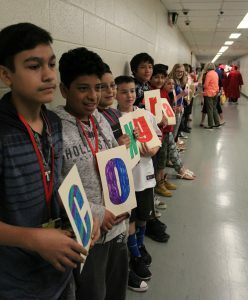 With plenty of smiles, high-fives, the sound of Mr. Mault’s trumpet, and just a few tears, Goshen Middle School offered a well-deserved show of appreciation for the seniors. Congratulations to you, seniors! Thank you for encouraging the next generation of Goshen High School students! 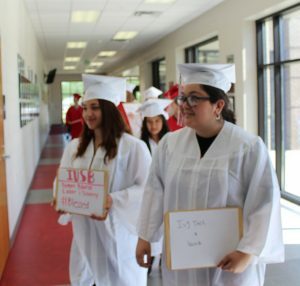 Seniors attending the senior walk need to bring their caps and gowns to school TODAY. You will be dismissed at 9:56 a.m. with the GTV bell and should put on the caps and gowns and head to door M.
Juniors: Don’t forget to turn in your consent form by TOMORROW if you are planning to take part in the Work Ethic Certification program during your senior year. Forms are available in the main office with Mrs. Wolfe. The Talent Show is here! This year the Cowboy Up! Talent Show will be held TOMORROW at GMS from 7-9:00 p.m. Come and enjoy the great GHS student’s performances. Don’t forget your cowboy costume! Go all out, but make sure it’s school appropriate and follow the school dress code – no toy guns please. Please join us for ADEC’s Walk, Run or Ride a Bike on Saturday at 7:30 a.m. at Northridge High School. You can register online at www.adecinc.com/bike. On-site registration is also available. The ride starts at 9:00 a.m. Ride, walk or run and raise funds to support people with disabilities in Elkhart County! The fee is $30 for adults and $15 for youth. This year we are pitting local students against each other for a chance to win cash for their school. The school with the highest participation rate will receive $500 to be used on its fitness program. Simply register online as a “youth” participant. When you pick up your packet you will find a ticket to cast your vote for your school. May the best school win! There will be a short meeting for all wrestlers TODAY during the 2nd session of SRT. It is important that all wrestlers attend. We will meet on the upper deck of the main gym. Fairfield won the 1st round of girls tennis sectionals over Jimtown by a score of 4-1. Jimtown’s 1 doubles pair is still alive in the doubles tournament starting next week. The boys JV baseball team defeated Northwood 2-1. Both teams were strong on the mound. Porter Revoir allowed just three hits to Northwood. Drew Marlow went 1-for-1 at the plate as he led the team with one run batted in. Bryant Robinson chipped in two hits. The boys varsity baseball team lost a heartbreaker to Northwood 6-5 on a walk off single in the bottom of the 7th. The RedHawks were behind 5-2 going into the 7th before a three run homerun from Robbie Riegsecker tied the game. Riegsecker had a single to go with his HR and Charlie Collins had two singles. The RedHawks couldn’t keep up with Northwood and fell 7-2 on Wednesday. The boys JV baseball team captured the lead in the first inning. They scored one run when Bryce Smith singled with two outs in the first inning. Jude Fitzgerald also drove in a run for the RedHawks. The girls varsity softball team lost on Senior night to Northwood 10-4. Gracie Hayes hit her first career homerun going two for three for the night. Elkah DeVoe and Ashton Darnell all had two hits for the night. AnaMaria Ramirez had the only double for the night. The girls JV softball team defeated Northwood 19-1. Ruth Whitehead got the win only allowing one hit. Heather Goertzen added four hits for night. Lindsey Camacho and Gabby Ott each had two hits apiece. Grace Vance had a three run triple. Goshen improved to 16-7 overall and 11-3 in NLC play. The girls varsity tennis team will host sectional semifinals at 4:30 p.m. The boys JV and varsity golf teams will host Elkhart Memorial at 5:00 p.m. The boys JV baseball team will host East Noble at 5:00 p.m. The boys varsity baseball team will play at East Noble at 5:30 p.m. The boys varsity track and field team will host sectionals at 5:30 p.m. Seniors attending the senior walk need to bring their caps and gowns to school TOMORROW. 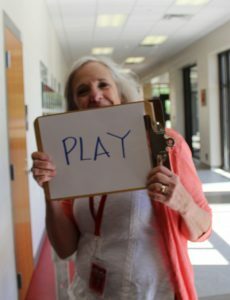 You will be dismissed at 9:56 a.m. with the GTV bell and should put on the caps and gowns and head to door M.
Juniors: Don’t forget to turn in your consent form by the end of next week if you are planning to take part in the Work Ethic Certification program during your senior year. Forms are available in the main office with Mrs. Wolfe. Come to the Red Zone TODAY and play Wii! If you get 1st place in Mario Kart you win a prize! This is the last week of the Red Zone so enjoy it while it’s still open! The Talent Show is here! This year the Cowboy Up! Talent Show will be held at GMS on Friday from 7-9:00 p.m. Come and enjoy the great GHS student’s performances. Don’t forget your cowboy costume! Go all out, but make sure it’s school appropriate and follow the school dress code – no toy guns please. HELP WANTED: We are looking for a motivated person who likes to work with people. Hours are Monday, Wednesday and Friday from 4-9:00 p.m. If you are interested please contact Judy at the Spinal Adjusting Center at 250-3942 or apply in person at 2424 Peddlers Village Road in Goshen. MasterBrand Cabinets will be at the Elkhart County Job & Internship Fair TOMORROW from 8:00 a.m. to 2:45 p.m. at the RV/MH Hall of Fame. Graduating seniors are invited to attend! Current Sophomores and Juniors who are interested in GHS’ annual trip to Stratford, Ontario for an inspiring weekend of theater should check with their English teacher or, alternatively, stop by Mr. Caskey’s room (3180) or email him at lycaskey@goshenschools.org for more information. We hope you join us! There will be a short meeting for all wrestlers TOMORROW during the 2nd session of SRT. It is important that all wrestlers attend. We will meet on the upper deck of the main gym. The boys JV golf team lost to Plymouth and Northridge. The team was led by freshman Joseph Narayan with a 57 followed by Derrick Stotts with a 59. Martin Lyrvall shot a 63, Zack Barker 64 and Don Perry and Zane Barker 70. The boys varsity golf team lost to Plymouth and Northridge. The team was led by junior Peyton Cripe who fired a 39, freshman Jake Jennette 48, senior Will Gaby 50, senior Will Troyer 55 and freshman Ben Schneider 59. The girls JV softball team defeated Northwood 4-2 in ten innings. Grace Vance picked up the win allowing three hits and striking out 19. Alexis Navarro hit two in the park home runs driving in all four runs. Devin Shipley had two hits and Makayala Snyder also added two hits. The girls varsity softball team defeated Northwood 2-0. Kate Atkinson pitched a one hitter with six strikeouts while throwing the shut out. AnaMaria Ramirez and Elkah DeVoe both had two hits apiece. The girls track team competed at Sectionals at Warsaw High School on Tuesday night. Goshen was led by Jill Kissinger’s 1st place finish in the 300m hurdles, Suzette Rodriguez’s 2nd place finish in shot put, Riley Martin’s 4th place finish in discus, Kyrah Fletcher’s 6th place finish in long jump, Alayna Yoder’s 7th place finish in the 100m dash, Jocelyn Valderrama’s 8th place finish in the 1600m run, the 4×100 relay’s 6th place finish (Brandi Smith, Kyrah Fletcher, Remya Johnson, Alayna Yoder), and the 4×400 relay’s 6th place finish (Brandi Smith, Kyrah Fletcher, Alayna Yoder, Jill Kissinger). Jill Kissinger (300 hurdles) and Suzette Rodriguez (shot put) are automatic qualifiers for Regionals next Tuesday at South Bend Saint Joseph. The girls varsity tennis team will host the 1st round of sectionals at 4:30 p.m. The girls JV and varsity softball teams will host Northwood at 5:00 p.m. The boys JV and varsity baseball teams will play at Northwood at 5:00 p.m.
HEY SENIORS! Stop by the RedZone TODAY to get your free bag of cookies. We appreciate you! Come to the Red Zone TOMORROW and play Wii! If you get 1st place in Mario Kart you win a prize! This is the last week of the Red Zone so enjoy it while it’s still open! The Talent Show is here! This year the Cowboy Up! Talent Show will be held at GMS on Friday, May 19th from 7-9:00 p.m. Come and enjoy the great GHS student’s performances. Don’t forget your cowboy costume! Go all out, but make sure it’s school appropriate and follow the school dress code – no toy guns please. The GHS cafeteria is offering free after school snacks THIS WEEK. 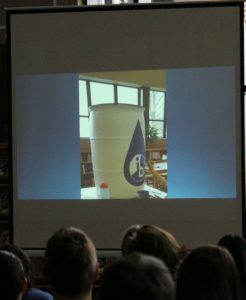 This program is only for students in after school activities on that day. All student-athletes, club members, music participants, drama participants, after school homework help kids, etc. are strongly encouraged to stop by the cafeteria after school and take advantage of this generous opportunity. Students just need to show their ID and they can grab a healthy snack to go that will hold them over during their after school activities until dinner. The cafeteria will stay open until 3:55 p.m. on Monday and 3:50 p.m. the rest of the week to hand out the snacks. Please join us for ADEC’s Walk, Run or Ride a Bike on May 20th at 7:30 a.m. at Northridge High School. You can register online at www.adecinc.com/bike. On-site registration is also available. The ride starts at 9:00 a.m. Ride, walk or run and raise funds to support people with disabilities in Elkhart County! The fee is $30 for adults and $15 for youth. This year we are pitting local students against each other for a chance to win cash for their school. 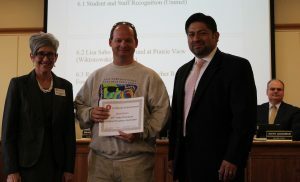 The school with the highest participation rate will receive $500 to be used on its fitness program. Simply register online as a “youth” participant. When you pick up your packet you will find a ticket to cast your vote for your school. May the best school win! There will be a short meeting for all wrestlers on Thursday during the 2nd session of SRT. It is important that all wrestlers attend. We will meet on the upper deck of the main gym. The unified track and field team traveled to Warsaw on Thursday to take on Elkhart Memorial, Wawasee, East Noble, Bremen, LaVille and Warsaw. The team participated in several events and had many people beating their personal best for the season. In the 100m dash, Breighton Heaberlin took 1st in her flight, Noah Olmedo took 2nd in his heat and Nate Elliot took 3rd in his heat. Beating Personal bests in the 100m were Nate Elliot, Breighton Heaberlin, Noah Olmedo, Hope Peeler, and Lexi Witmer. In the 400m dash, Zach Templeton beat his personal best and placed 5th out of 9. The 4x100m Relay team of Spencer Witmer, Jesse Rhoades, Laura Scott, and Zach Templeton placed 5th in their heat out of 9. In the shotput, Austin Peeler and Spencer Witmer took 4th in their flights and Laura Elliot took 5th in hers. Beating their personal best was Laura Elliot and Spencer Witmer. In the long jump, Hope Peeler took 2nd in her flight with Nate Elliot and Noah Olmedo took 4th in his flight. Beating their personal best was Hope Peeler. The RedHawks will be at Central Noble for sectionals on May 20th at 1:00 p.m. The girls varsity softball team played well for six innings trailing by three runs, but lost it in the 7th to the #3 team in the State in 3A softball. Elkah DeVoe had two hits and AnaMaria added one. The girls tennis team finished the regular season in winning fashion with a 4-1 victory over Elkhart Central. Lineth Alvarez at 2 Singles and Cheyenne Kalb at 3 Singles took care of business in straight sets. The 2 doubles pair of Brooke Grewe and Anna Podgorski built off of their strong NLC tourney with a 6-1, 6-3 victory of their own. Kayleigh Crowder toughed out a 7-6 first set and overcame a 0-3 start to the 2nd set to win six straight and finish off the evening. JV winners were Madison Rittenhouse, Sophia Kirkton, Sage Christner and Katia Gutierrez. The girls JV softball team lost to Wawasee 14-4. Devin Shipley had two hits, while Breanna Boocher added a double. Gabby Ott also had a single. Ruth Whitehead got the loss in the circle for the RedHawks. The boys varsity baseball team defeated Wawasee 15-9. Tyler Colpitts earned a hard fought win on the mound pitching through six RedHawk errors during his four innings of work. He struck out six and allowed only two earned runs. Chase Knoblock threw two stellar innings of relief and Mike Pinarski finished things out in the 7th. Offensively Charlie Collins hit a grand slam and doubled. Pinarski, Colpitts, Trenton Scott and CJ Detweiler all had two hits. The boys JV baseball team lost to Wawasee 3-2. Bryce Smith threw a complete game and only surrendered two walks. Unfortunately, the RedHawk bats were silenced for the majority of the night by Wawasee pitching. Jack Immel led the RedHawk offense with two hits including a double. The girls JV and varsity softball teams will play at Northwood at 5:00 p.m. The boys JV and varsity golf team will host Northridge and Plymouth at 5:30 p.m. The girls varsity track and field team will compete in sectionals at Warsaw at 5:30 p.m. The boys JV baseball team dropped a close game on the road against Concord losing by a score of 3-1. Porter Revoir gave up zero earned runs, but unfortunately gave up three runs on five defensive errors. Drew Marlow had the lone Goshen run and had two hits. The boys varsity baseball team defeated Concord 10-7. Chase Knoblock got the win on the mound throwing four innings in relief of starter Austin Cain. Michael Pinarski struck out the final hitter for a save. Offensively, CJ Detweiler had a single, double and three RBI’s. Charlie Collins, Robbie Riegsecker and Tyler Colpitts all contributed two hits apiece. The girls tennis team finished 8th in the NLC after completing the conference tourney last week. Lineth Alvarez-Barrera went 2-1 at 2 Singles to finish 5th. Cheyenne Kalb got a win at 3 Singles and the 2 doubles pair of Brooke Grewe and Anna Podgorski played six sets in under six hours Thursday night, including a come-from-behind 3-set win. The girls varsity softball team lost to Concord 8-6. Kate Atkinson gets the loss in the pitching circle, but Ashton Darnell went 3 for 3 at the plate. The RedHawks had nine total hits while Concord had ten. The girls JV softball team defeated Concord 18-2. Grace Vance was the winning pitcher while helping herself out with hitting a double and triple with two RBI’s. Makayla Snyder also added two hits and scored three runs. Sarai Rodriguez also added two hits and two RBI’s. The boys JV baseball team traveled to Angola and won both games of a double header on Saturday. Goshen took the lead late in the game in a 3-2 victory over Angola on Saturday. Goshen trailed 2-1 in the top of the 4th inning when Braxton Kincaid doubled to drive in two runs. Kincaid earned the win for Goshen. He tossed five innings, giving up two runs, four hits and striking out two. Jack Immel went 2-for-2 at the plate to lead Goshen in hits. The boys JV baseball team traveled to Angola and won both games of a double header on Saturday. Goshen defeated Angola 5-4 after taking the lead late in the game. Josh Haimes earned the win for Goshen. He tossed three innings, surrendering one run, two hits, striking out one and walking one. Newell started the game for Goshen. He pitched two innings, surrendering three runs, two hits and striking out one. Austin Cain, Braxton Kincaid and Newell each managed one hit to lead Goshen. The girls JV softball team won game 1 on the tourney and beat Warsaw 11-7. Grace Vance got the win in the circle. Alexis Navarro had four hits with two singles, one double and one triple for the day. Gabby Ott also added three hits. They ended up losing to Wawasee 9-3. Ruth Whitehead got the loss. Grace Vance, Devin Shipley and Sara Breniser all had one hit for the RedHawks. Goshen took runner up in the weekend JV tournament. The boys varsity golf team posted a 379 over the course at Mystic Hills. The RedHawks posted their best 18 hole score of the season over the course at Mystic Hills in Culver during the Culver Academy Invitational. Goshen was led by Peyton Cripe who fired an 89, Jake Jennette 95, William Troyer 102, Ben Schneider 107 and Allan Garratt 110. The girls varsity tennis team will host Elkhart Central at 4:30 p.m. The girls JV tennis team will host Elkhart Central and Elkhart Christian Academy at 4:30 p.m. The girls JV and varsity softball teams will host Wawasee at 5:00 p.m. The boys JV and varsity baseball teams will compete at Wawasee at 5:00 p.m. The GHS cafeteria is offering free after school snacks the week of May 15th. This program is only for students in after school activities on that day. All student-athletes, club members, music participants, drama participants, after school homework help kids, etc. are strongly encouraged to stop by the cafeteria after school and take advantage of this generous opportunity. Students just need to show their ID and they can grab a healthy snack to go that will hold them over during their after school activities until dinner. The cafeteria will stay open until 3:55 p.m. on Monday and 3:50 p.m. the rest of the week to hand out the snacks. On behalf of the Interra Credit Union RedHawks branch, a big congratulations to senior Maddison Simpson, the winner of this year’s prom promotion! Maddison is getting two prom tickets, a $75 gift card to Antonio’s and $50 to help with miscellaneous prom expenses. 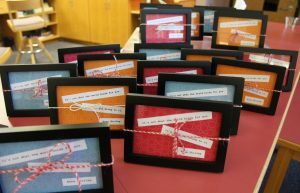 Thank you to the many GHS students who visited the RedHawks branch to enter the contest. We hope that you all have a fun and safe 2017 prom! HELP WANTED: If you are 18 years old and interested in working as a pool monitor, Twin Pines is looking for a part time to full time employee. To apply, please stop by their office at 2011 W. Wilden Ave. in Goshen to fill out an application. 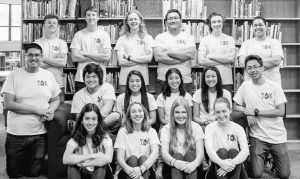 One Act Plays and the annual Spring Art Show will be presented TONIGT from 7-9:00 p.m. in the GHS Auditorium and Commons. Come enjoy these two events. The tickets for One Acts are $5 per person. Doors open for seating at 7:15 p.m. Come see artwork from our GHS students and plays that are written, directed and performed by GHS students. IHSAA Student-Athlete Tip of the Week: Are you looking forward to the end of the school year? Are you still applying yourself in the classroom? Are your grades where they need to be? Are you making excuses for any shortcomings or failures? This is the time of year where it’s very easy to lose concentration on your academic and athletic prowess. In fact, the following statement from an NBA coach really applies to this last month of school, especially if you are struggling, somewhat. “You have a choice. You can give in, you can give up, or you can give it your all.” Make the most of this last month of school. Give it your best. While this quote was spoken in a locker room, it applies as well to the student-athlete putting the final touches on the end of another school year. Give it your all! MasterBrand Cabinets will be at the Elkhart County Job & Internship Fair on May 16th from 8:00 a.m. to 2:45 p.m. at the RV/MH Hall of Fame. Graduating seniors are invited to attend! Wire Design is a local manufacturer of electrical wiring harnesses. We have immediate openings in all departments. Training will be provided. We have great benefits and a great working environment. Please apply in person at: 2520 Industrial Parkway in Elkhart. Please call Human Resources at (574) 293-2990 with any questions. Help Wanted: Seniors, are you looking for a great, full-time job after high school? Conn Selmer is looking for help! You must be 18 years old or older and be willing to work a full-time 40 hour week. Submit your resume to hrresumes@conn-selmer.com or fill out an application at 600 Industrial Parkway in Elkhart. 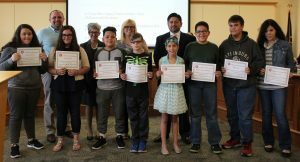 The Goshen Unit of the Boys & Girls Club of Elkhart County has operated in four different sites this school year – Grace Community Church, First Baptist Church, Chamberlain Elementary School and North Goshen Mennonite Church. We thank you all for your assistance and patience during this process! We will begin our summer programs on June 12th in a beautiful, newly renovated and much larger club! To give our staff time to prepare the newly remodeled club for summer programs we will end our school year programs TODAY. You are all welcome to join us in celebrating our opening during our Community Open House on June 10th from 9:00-11:00 a.m. at 306 Crescent St. in Goshen. If you have any question feel free to call our office at 533-4793. Thank you so much for your assistance and cooperation during the clubs transitional period! LAST CHANCE: Prom tickets are on sale TODAY during all lunches! Tickets are now $45. The girls varsity softball team played well last night but lost to East Noble, 8-3. Caitlyn Doyle and Grace Vance did the pitching for the RedHawks. AnaMaria Ramirez and Alexia Nettrouer both had two hits. Nettrouer had two doubles with two RBI’s while Ramirez had a double and a triple. Gracie Hayes also had a triple and one RBI. Goshen’s C baseball team was defeated at Penn 10-0. Jocsan Sanchez pitched 4.2 innings and only surrendered five earned runs. James Troyer was the lone bright spot for the RedHawk offense getting on base two times. He had one single and was also hit by a pitch. The boys varsity golf team lost to Concord and Northwood. Goshen was led by Ben Schneider and Peyton Cripe with 52, William Troyer 56, Allan Garratt 60 and Jake Jennette 61. The boys JV golf team lost to Concord and Northwood. Joseph Narayan led the team with a 59, Gabe Yoder 61, Derrick Stotts 62, Don Perry and Will Gaby 64 and Martin Lyrvall 74. The girls varsity tennis team will compete in NLC finals at 4:30 p.m. The boys JV and varsity baseball teams will play at Concord at 5:00 p.m. The girls JV and varsity softball teams will play at Concord at 5:00 p.m. The boys varsity golf team will compete in the Culver Academy Invite at Mystic Hills starting at 9:00 a.m. The boys JV baseball team will compete in a doubleheader in Angola starting at 9:00 a.m. The girls JV softball team will compete in the Tiger Tourney at CCAC at 9:00 a.m. The boys and girls JV track and field team will compete in the Charger JV Invitational starting at 10:00 a.m.
Key Club would like to thank the staff and students who donated soaps, shampoos and other personal care items for the Parent Comfort Cart at Riley Hospital for Children. We collected nearly 200 items! Your donations are appreciated. The Van Buren Hotel of Shipshewana, Indiana is now accepting applications for full and part time housekeepers, a breakfast bar attendant and a laundry attendant. Employment is seasonal (April-November) and you can earn PTO (personal time off). We offer competitive wages. Please apply in person at 1175 N. Van Buren St. in Shipshewana. The Crimsonaires is a group that performs approximately 25 times each year in a show choir style. Crimsonaire auditions for next year’s group are TODAY after school. Come by the choir room and sign up for a time. Auditions are open to all GHS students. You need to bring something you can sing for the audition. One Act Plays and the annual Spring Art Show will be presented this Thursday and Friday from 7-9:00 p.m. in the GHS Auditorium and Commons. Come enjoy these two events. The tickets for One Acts are $5 per person. Doors open for seating at 7:15 p.m. Come see artwork from our GHS students and plays that are written, directed and performed by GHS students. 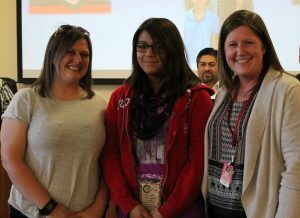 The Goshen Unit of the Boys & Girls Club of Elkhart County has operated in four different sites this school year – Grace Community Church, First Baptist Church, Chamberlain Elementary School and North Goshen Mennonite Church. We thank you all for your assistance and patience during this process! We will begin our summer programs on June 12th in a beautiful, newly renovated and much larger club! To give our staff time to prepare the newly remodeled club for summer programs we will end our school year programs on May 12th. You are all welcome to join us in celebrating our opening during our Community Open House on June 10th from 9:00-11:00 a.m. at 306 Crescent St. in Goshen. If you have any question feel free to call our office at 533-4793. Thank you so much for your assistance and cooperation during the clubs transitional period! Prom tickets are on sale now during all lunches! Sale dates are Tuesday-Friday of this week. Morning ticket sales will be on May 12th from 7:45-8:15 a.m. Tickets are now $45. It’s time for the annual GHS Prom Dress Drive! This purpose of this drive is to provide free dresses for students who want to go to the prom but may be in financial need. We have several dresses in various styles and sizes to choose from. If you are in need of a prom dress or if you wish to donate a gently used dress, please contact Mrs. Hershberger or Mrs. Shakley. You may also ask your SRT teacher for more information. The ambassadors cookout will be TODAY during the 2nd session of SRT in the administration building lot, weather permitting. All Stay In Bounds ambassadors are invited to attend for lunch as a thank you for your hard work from the athletic department. Thanks for making our 4th grade kids RICHER! The boys varsity baseball team defeated Plymouth 3-0. Tyler Colpitts threw a complete game shutout to improve to 6-1 on the mound for the season. He didn’t walk a batter and had six K’s. The RedHawks did not commit an error. Austin Bontrager, Robbie Riegsecker, Charlie Collins, Tyler Colpitts, Mike Pinarski and Philip Wertz all contributed singles. The boys JV baseball team lost the lead late in a 3-2 defeat to Plymouth. Goshen had seven hits in the game. Eric Newell, Drew Marlow and Jack Immel each collected multiple hits for Goshen. Goshen was sure-handed in the field and didn’t commit a single error. The girls varsity softball team defeated Plymouth 11-10. Sara Breniser went 3 for 4 with two RBI’s while Kate Atkinson also added two hits and two RBI’s. AnaMaria Ramirez had two hits as well. The girls JV softball team defeated Plymouth 16-4. Ruth Whitehead got the win in the circle for the RedHawks. Devin Shipley had four hits while Mikayla Snyder added two. The unified track and field team will compete in the Warsaw Invitational at 5:30 p.m. The girls varsity tennis team will compete in NLC prelims at 4:30 p.m. The boys varsity baseball team will host Elkhart Central at 5:00 p.m. The boys JV and varsity golf teams will play at Bent Oak vs. Concord and Northwood at 5:00 p.m. The boys baseball C team will play at Penn at 5:00 p.m. The girls varsity softball team will compete at East Noble at 5:30 p.m. Letters of Interest should be received no later than May 19, 2017 and will then be reviewed by the Board, with interviews to follow. Appointment by the Board to fill this seat will be by majority vote of the full Board. The term for this 4-year appointment began on January 1, 2015. 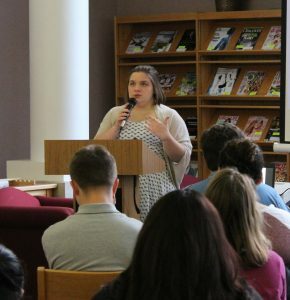 Applicants are encouraged to review policies 0140 and 0144.2 located on the GCS policy website at http://www.neola.com/goshen-IN prior to the interview. A detailed map of District 1 is available online at http://www.goshenschools.org/about/board-of-education/ or may be picked up at the GCS Administration Center located at 613 E. Purl St. Goshen. 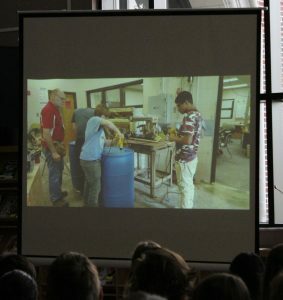 Thank you for your interest in the educational process of the children of the Goshen community. Goshen Community Schools has received notification from the Indiana State School Music Association (ISSMA) that the band and orchestra at Goshen High School are recipients of the ISSMA All-Music Award for 2016-17. ISSMA will present special banners to the band and orchestra programs to display in recognition of their outstanding achievements. Congratulations to the talented young musicians, and to the band and orchestra directors, on your outstanding musical accomplishments this year! Any wrestler going to camp needs to see Coach Pickard TODAY if you did not do so yesterday. The camp list needs to be sent out this week. The Crimsonaires is a group that performs approximately 25 times each year in a show choir style. Crimsonaire auditions for next year’s group are TODAY and TOMORROW after school. Come by the choir room and sign up for a time. Auditions are open to all GHS students. You need to bring something you can sing for the audition. One Act Plays and the annual Spring Art Show will be presented this Thursday, May 11th and Friday, May, 12th from 7-9:00 p.m. in the GHS Auditorium and Commons. Come enjoy these two events. The tickets for One Acts are $5 per person. Doors open for seating at 7:15 p.m. Come see artwork from our GHS students and plays that are written, directed and performed by GHS students. The ambassadors cookout will be TOMORROW during the 2nd session of SRT in the administration building lot, weather permitting. All Stay In Bounds ambassadors are invited to attend for lunch as a thank you for your hard work from the athletic department. Thanks for making our 4th grade kids RICHER! 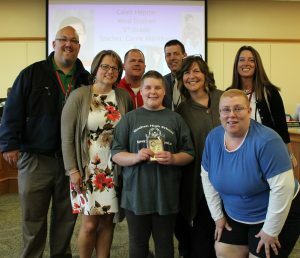 The unified track and field team hosted the 1st annual Unified Track and Field Invitational on Friday, May 5th to take on Central Noble, East Noble, Warsaw, Wawasee and Elkhart Memorial. The team participated in several events and had many people beating their personal best for the season. In the 100m dash, Lexi Witmer, Breighton Heaberlin and Noah Olmedo took 1st in their heats with Olmedo beating his personal best time. Nate Elliot and Hope Peeler took 2nd in their heats. In the 400m dash, Laura Scott took 2nd place and once again beat her personal best time. Austin Hardesty also beat his personal best time again and took 3rd in his heat. The 4x100m Relay team of Spencer Witmer, Jesse Rhoades, Laura Scott and Zach Templeton came in with a faster time again this season and placed 3rd in their heat. In the shotput, Austin Peeler took 1st in his flight and Jesse Rhodes took 3rd in his flight. In the long jump, Noah Olmedo and Nate Elliott scored 1st in their flights. Lexi Witmer and Breighton Heaberlin scored 2nd in their flights. Jazmin Vargas took 3rd in her flight. The Redhawks will be at Warsaw for their next meet on May 11th at 5:30 p.m.
Warsaw defeated the boys JV golf team 180-241. The team was led by Ben Schneider with a 55, Derrick Stotts fired a 58, Joseph Narayan added 63, Don Perry 65 and Will Gaby 72. The boys varsity golf team lost to Warsaw and Wawasee. Goshen was led by Peyton Cripe with a 43, William Troyer shot 48, Allan Garratt fired a 49, Jake Jennette 56 and Gabe Yoder 66. The Goshen Girls Track team ran very well at the NLC Championship, taking 4th place after coming in ranked 5th in the conference. The girls track team ran very well at the NLC Championship, taking 4th place after coming in ranked 5th in the conference. Goshen was led by Jill Kissinger’s 1st place finish in the 300m hurdles and 2nd place finish in the 100m hurdles, Alayna Yoder’s 6th place finish in the 200m and 7th place finish in the 100m, Ariana Perez Diener’s 6th place finish in the 3200, Kyrah Fletcher’s 5th place finish in the long jump and 5th place finish in the 100m hurdles, Suzette Rodriguez’s 3rd place finish in the shot put and 7th place finish in the discus, Kassandra Rodriguez’s 4th place finish in the shot put, Kayleigh McKee’s 6th place finish in the pole vault, the 4×100 relay’s 4th place finish (Brandi Smith, Kyrah Fletcher, Remya Johnson, Alayna Yoder), and the 4×400 relay’s 4th place finish (Brandi Smith, Kyrah Fletcher, Alayna Yoder, Jill Kissinger). The boys JV and varsity baseball teams will compete at Plymouth at 5:30 p.m. 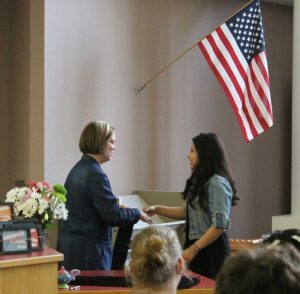 The girls JV and varsity softball teams will host Plymouth at 5:30 p.m.
At the board meeting on Monday, May 8th, the board recognized the students who were nominated for the 2017 Turn Around Awards. 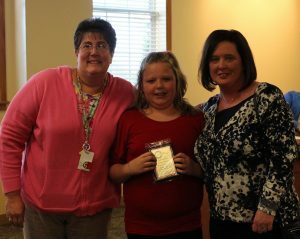 Every year, each school nominates one student who has shown the most growth or improvement in their school. 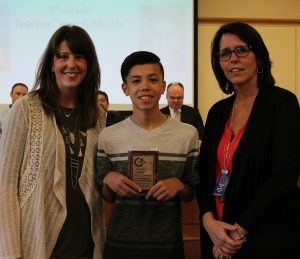 Students may be recognized for attendance, academic growth, leadership or any number of attributes that their teachers, counselors, and principals notice through the year. Congratulations to our 2017 Turn Around Award winners, and thank you for all of your hard work!